This was a fantastic book. The kind I’ve come to expect from Mr. Mull. The only downside? I was craving Milk Duds all week. Nate isn’t thrilled about moving to a new neighborhood, but he quickly makes friends with Summer, Trevor, and Pidgeon, who will all be starting fifth grade with him, and is accepted into their detective/treasure-hunting/trespassing club. Little do they know, all three skills would soon be put to use. The kids befriend the owner of the town’s new sweet shop and do errands for free candy. Before long, Mrs. White offers them magical candy that causes some awesome physical abilities, but the errands get weirder—robbing the museum, robbing a grave, wiping someone’s memory permanently. They’re in over their head. But the candy’s just so cool! Eventually, they learn the truth about the candy maker. But by now nearly every adult in town is addicted to her behavior-modifying fudge. And the school’s three worst bullies have replaced them as her errand runners. Who can they trust? And how can they stop her? 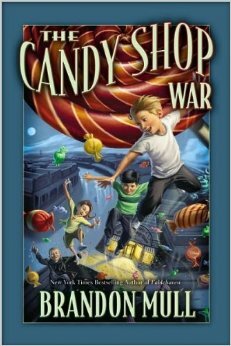 I’d classify The Candy Shop War as definite middle grade, appropriate for ages 8+, but it’s lengthy. At 419 pages, it isn’t for the faint of heart. It’s a perfect read-aloud, however, with tons of originality and fun imagination. I highly, highly recommend it for youngsters who are craving action and adventure and for moms who want to keep those adventures clean and age appropriate. This really looks like it’s packed with action and a great mystery to unravel. What a great story. Merry Christmas! I’d love to be able to fit this one into our school year. We’ll see. Treasure Island’s up next. Have a fabulous Christmas, too, Pat! Erik, being familiar with the kind of books you like best, I would recommend you put this one on your must-read list. You will absolutely love it. It’s the best adventure book I read this year.